Your iPhone 7 or 8 deserves a stylish case, so design your own and flaunt your individuality. The personalised iPhone 7 case is also for the iPhone 8 and is made from glossy, scratchproof plastic, offering your gadget the best protection. Featuring a full-colour print wrap around the edges, your custom iPhone 7 case is a standout accessory for girls, boys and adults alike. Design your own custom iPhone 7 photo case and treat your gadget to a well deserved makeover. We all love to show off our unique style, and with our phones being with us 24/7, there's the perfect opportunity to flaunt photos and designs. Upload your original images and ensure your smartphone stands out. Not only is this a fashion statement, but it's also practical, ensuring nobody confuses your phone with theirs. Made from glossy scratchproof plastic, this is the best protection for your phone, helping to preserve the quality and prolong its life. Easy to use design, struggled with other sites to design case, amazing customer service and always updated very quickly, and also came really quick....and just as I designed and lovely quality product!! Will definitely be using again!! This is the second time I've ordered a personalised case for my iphone with bags of love and i’ve not been disappointed. Quick service and a really good product. Would definitely recommend. Like many of our products, the iPhone 8/iPhone 7 personalised case comes with a quantity discount. When you buy 4 or more, you save money per case, so design one for all the family now and enjoy this discount. Your protective iPhone 7 personalised case is made to order in our London studios, printed and finished to perfection. We use a specialist process that ensures the inks fuse deep into the material, giving a photo quality, high definition finish that lasts forever. Your images won't peel away or scratch off over time. The plastic case is moulded and the relevant holes are cut out to accommodate the camera, side buttons and charger. Care: Please only use your personalised case for the iPhone 7 and 8, and do not try to force another model inside as this will result in damage to the case and phone. Always take care when removing the case to clean it or access your battery area. Should it get dirty, simply wipe clean with a tissue or damp cloth. Please be aware of the camera holes, visible in the design interface. Anything placed inside this area will be cut out, so make sure important design features are kept away, especially elements like eyes if you're printing a face. Your photos wrap around the side, covering the entire personalised iPhone 7 case, so consider this is you have design features that reside on the edges. Design a personalised iPhone 7 case for your forgetful mum and encourage her to pick up her mobile before leaving the house. Printed with a funny reminder such as 'Please Don't Leave Me!' or 'Aren't You Forgetting Something? ', it should be easier to get in contact with your mum when she's out shopping. For your social media loving friend, choose all the best Instagram snaps or SnapChat filters and design a unique iPhone 7 case personalised with happy memories. It's a totally different gift that is both useful and sentimental. Add a message such as 'You're My Bestie' and make it truly personal, be a designer yourself. For your boyfriend or husband, you could go down the cute or humorous road, depending on their personality. A photo of the two of you together could be a nice touch for the more romantic of partners, or alternatively, print a picture of him and his buddies at their football match if he's into his sport. 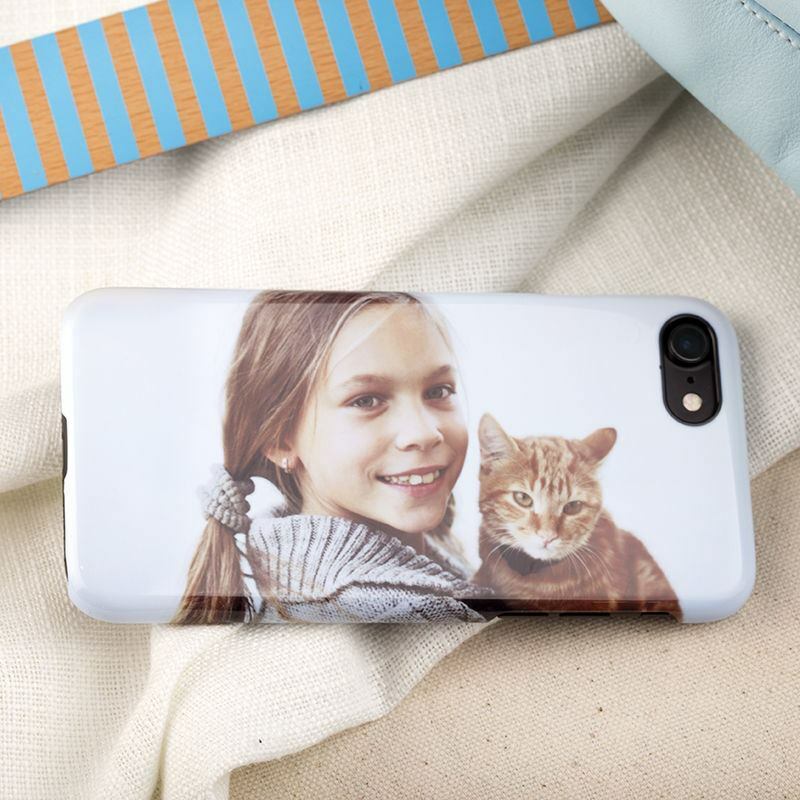 For the pet lover, you could create phone accessories with funny cat pictures, or photos of cute dogs. You could create a newspaper-style review of your best friend and have that printed on there, or just your favourite image of the two of you and their name. Doodle and jot down notes with your very own personalised printed pen. This handy pen also features an LED torch light. Personalised iPhone 6 phone case. Create your own bespoke printed iPhone cover by uploading your favourite photos or designs.